Saturday June 8th will be the second year of one of the largest sheep events in Ireland. 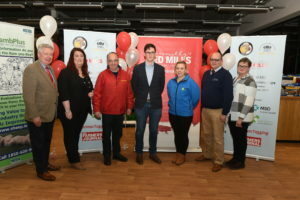 Held at Cillín Hill Mart in Kilkenny and with Connolly’s RED MILLS as the main sponsor the NSBA RED MILLS Championships provides a day of showing, industry related talks, exhibitions, trade stands and of course socialising with like minded people. 2018 was a great introductory year, including 5 All Ireland Championships and a commercial section. In excess of 700 sheep competed in four purpose-built rings across the day. For 2019 the NSBA aim is to increase the number of sheep present – with 4 All Ireland showing slots already confirmed, alongside other breed society classes, it is looking likely this aim will be achieved. A number of bodies including The Irish Farmers Journal and MSD are combining knowledge and expertise on the day to host a number of seminars; incorporating key aspects that both commercial and pedigree flock owners need to know, more details and contributors will be confirmed closer to the event. New attractions to the day include Working sheepdog trials and for our younger attendees we are delighted to have Alma Jordan with her Agrikids workshops which focuses on farm safety in a fun and interactive approach. The prizefund for the commercial classes has increased to over €2500 and sees the introduction of a new class this year ‘Best Commercial Pair’ with a top prize of €400. Sheep Ireland have also joined forces with the event to bring a technical input and also a special Multibreed class for recorded rams. The event is planned to be informative for all sheep farmers and the variety of breeds present are sure to quench any sheep enthusiasts search for quality and information. New for 2019; a prize for the best trade stand, a champion of show exhibit judged during the parade of champions, a door prize presented at random to a lucky attendee, diversification ideas from the sheep sector and seminars on compliance, making a profit and what the future might hold for the Irish sheep industry. With a wide variety of trade stands from all aspects of the sheep industry also present on the day this really is an event not to be missed by pedigree or commercial sheep breeders nationwide.